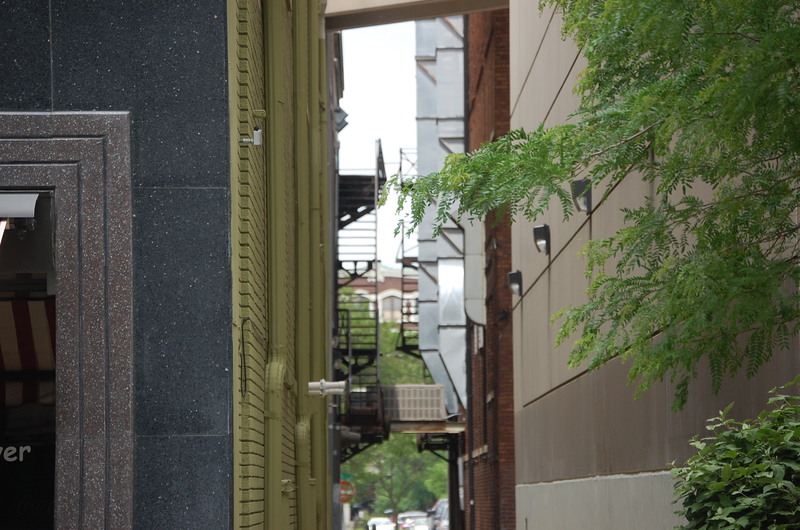 Yesterday I met my niece Wendy in downtown Fort Wayne with my camera. She is doing a project with letters from business signs, so we walked and drove the town to the particular spots that she needed. It was a fun few hours and I snapped some pictures to share along the way also. This is also where we had lunch at J.K. O’Donnells, Irish Pub. 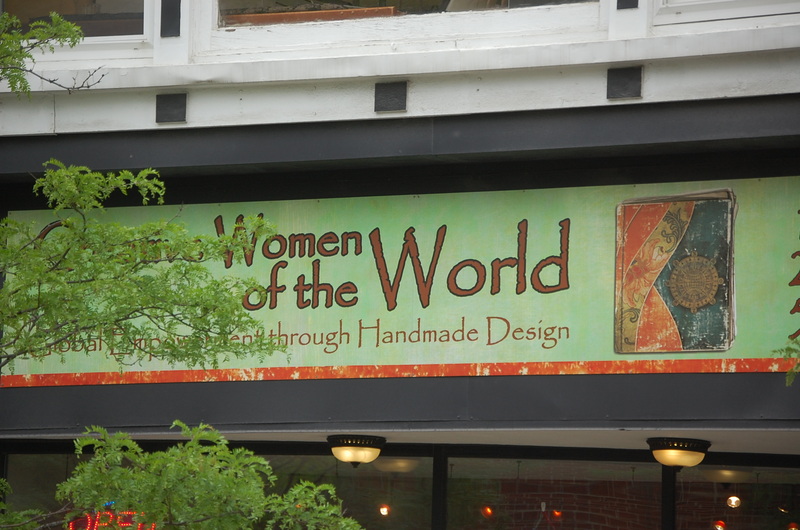 Right next door to J.K. O’Donnells is this store, Creative Women of the World. The lower floor had handmade items from different countries made by women who had gone through human trafficking, natural disasters to name two, just terrible strife in their lives. They are taught to be entrepreneurs. The second floor is a lotus gallery showing local artists creations. Wendy was parked on this street and had to feed the parking meter so I snapped this shot. 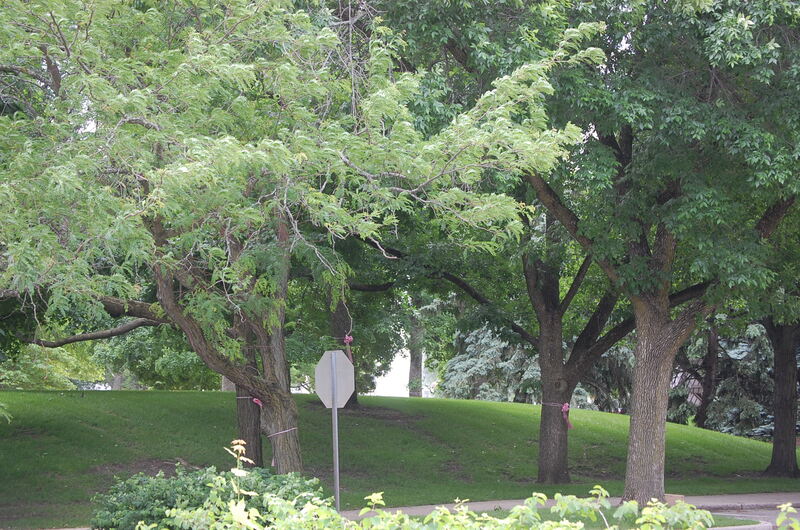 I liked the trees on both sides of the sidewalk. Fort Wayne has beautiful huge pots planted with flowers throughout. 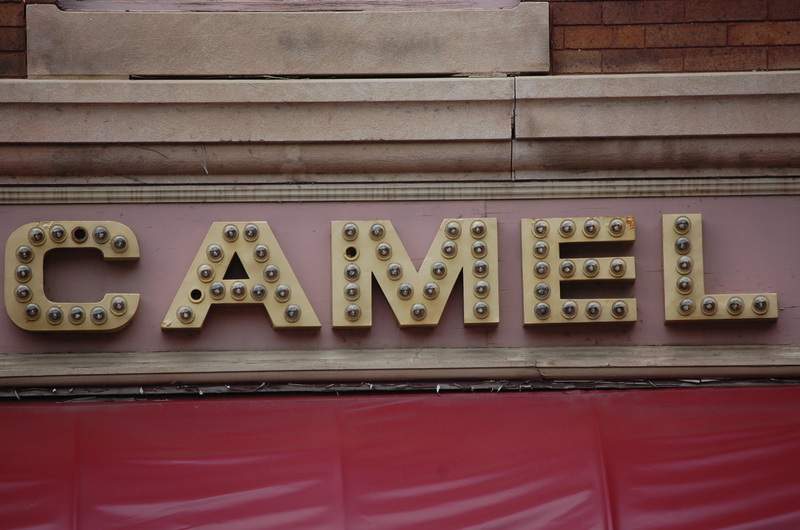 Our next sign stop was the Thirsty Camel on Washington in Fort Wayne. 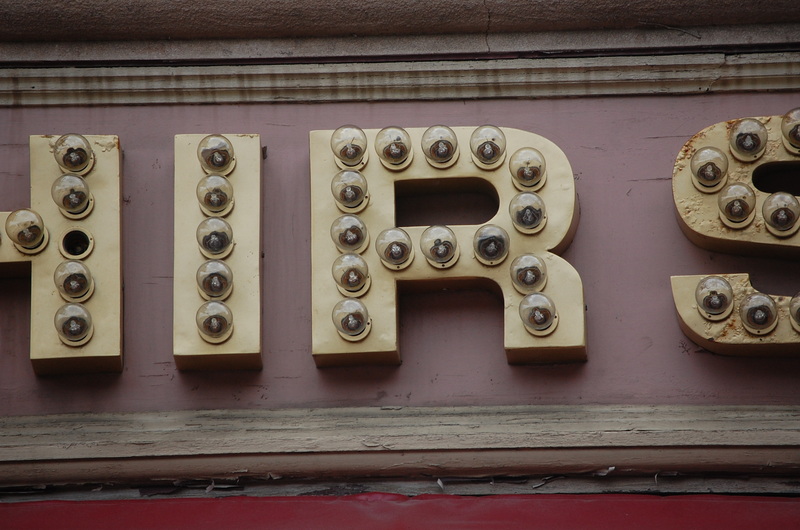 They definitely had neat letters. I was across the street to take these. I decided to stand in the middle of the street for a closeup…before the light changed….Washington is a main street through the city. She needed the R.
Wendy told me she had a thing for taking pictures through alleys, so we made our way back to the car through this alley. It was not menacing at all during the day. I would not have enjoyed it at night. 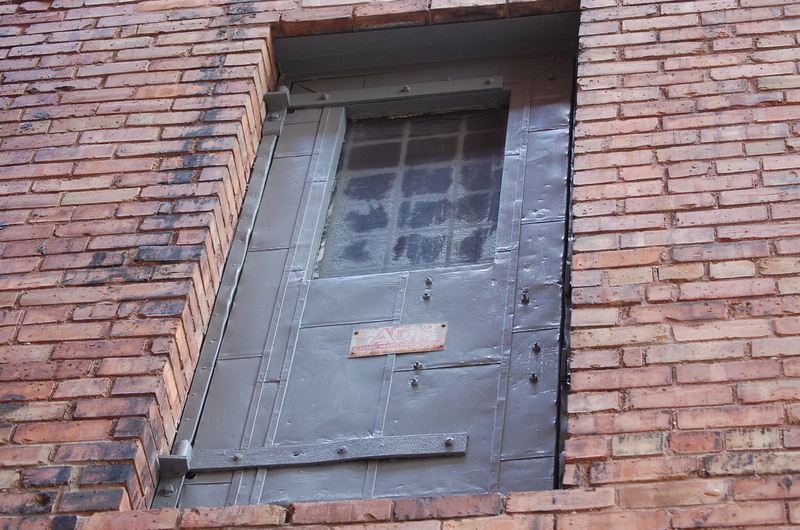 Interesting window. I don’t know the history of the building but it looks like it belonged on an insane asylum! This window had seen better days. 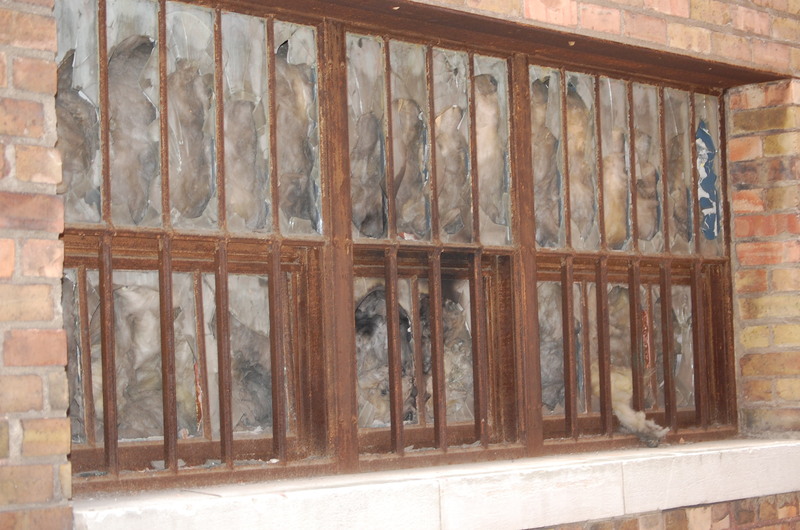 Again rusted bars…don’t know what went on in these buildings. It was a nice day for a walk. A bit of coolness in the air and great to take walks in. 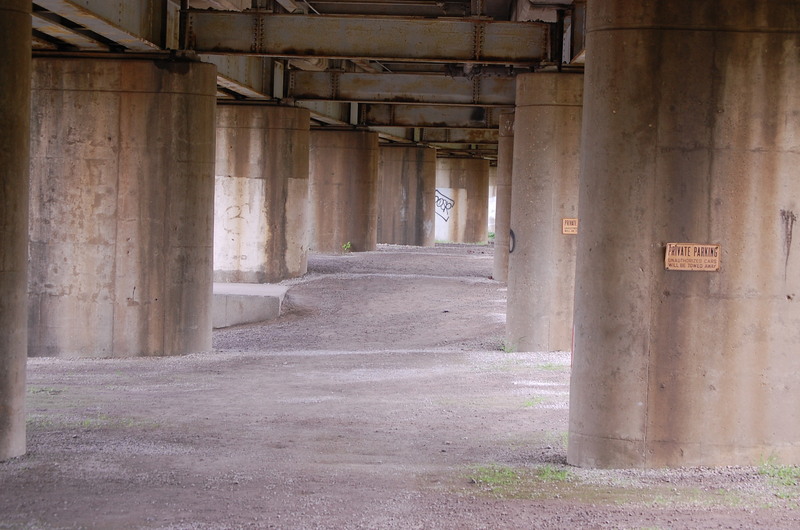 In that alley was this picture on a pole or a pipe. 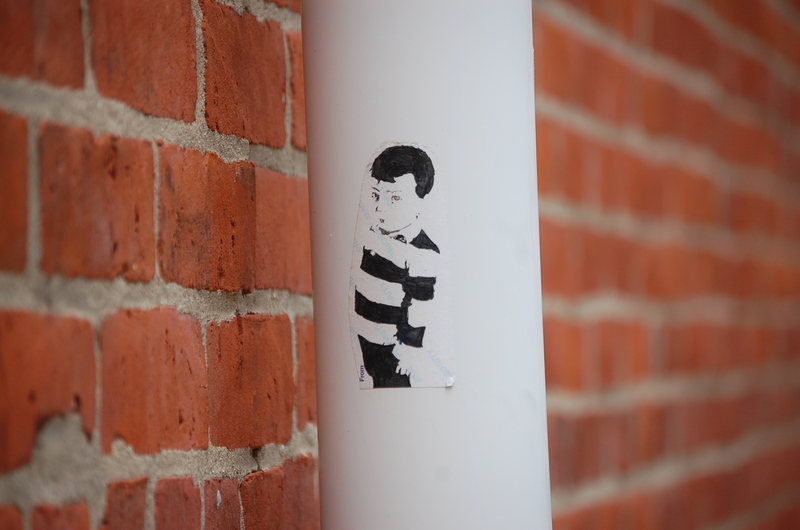 Thought this little striped shirt boy was interesting in an interesting place. 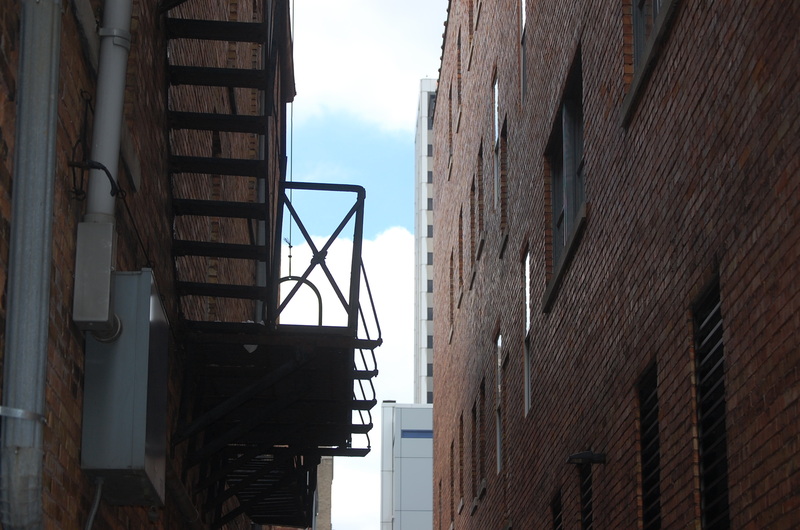 Alley picture all the way down with the fire escapes. Our next sign stop was Club Soda on Superior Street. She needed the “S” from it. 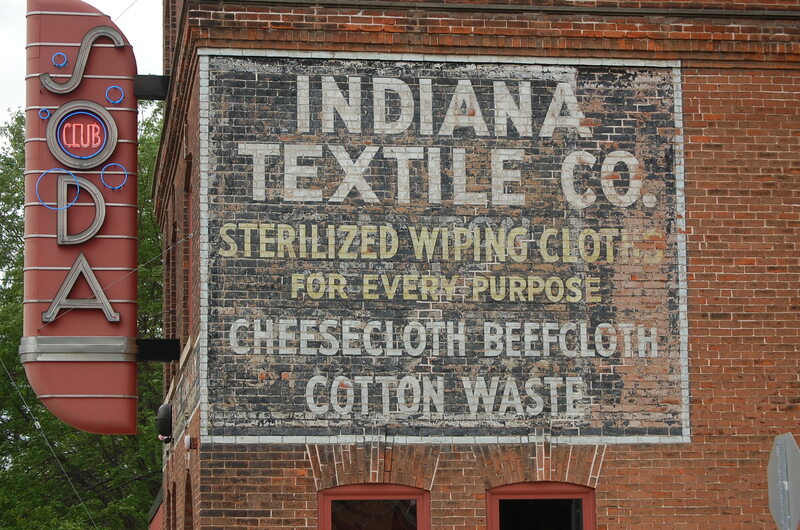 The building is very neat, it used to be a textile company, as you can tell from the sign. 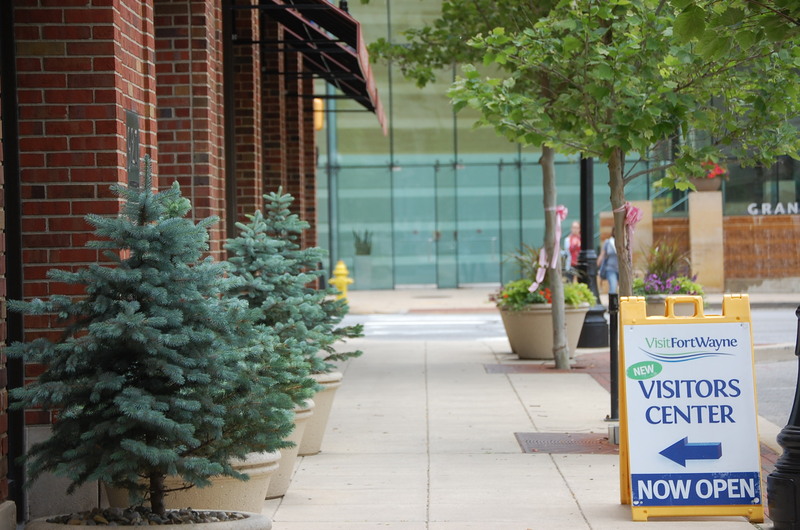 Across Superior Street from Club Soda is access to a park, Freiman Square, Artlink, The Fort Wayne Museum of Art and also where the Wabash and Erie Canal used to be. I took this from afar on the back side of the park. We had to keep moving. 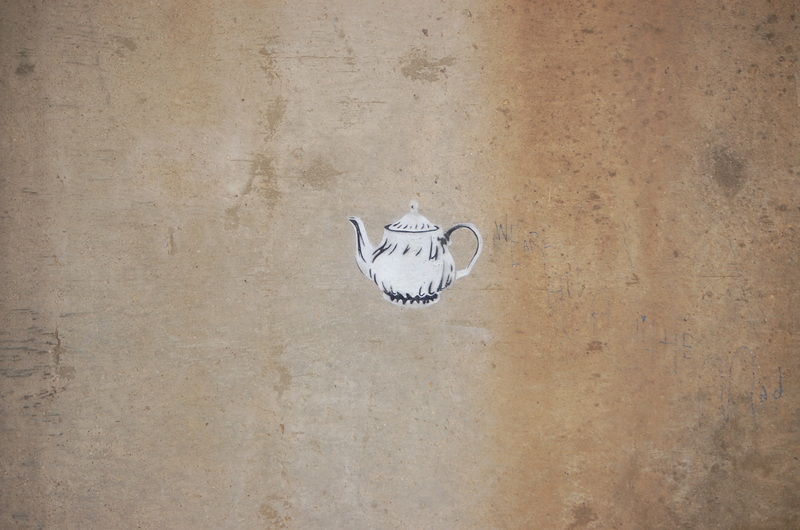 I am not sure if this was painted, drawn, a sticker but this pretty tea pot was on the cement wall. This is where the canal had been. After it was bankrupt and trains became popular in the 1800’s the canal bed was filled in and the railway was put in. 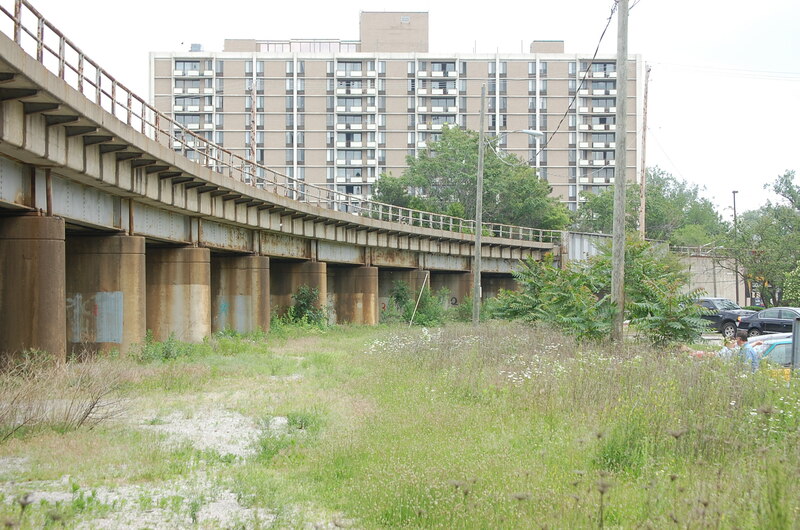 Still being used today to go over Fort Wayne. The Historical Marker for it. 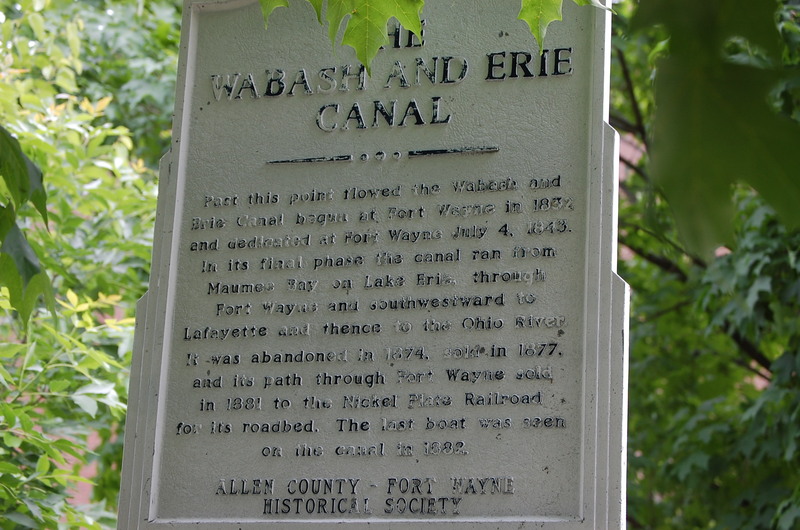 The canal was very important to Fort Wayne, once it came through the city grew by leaps and bounds. 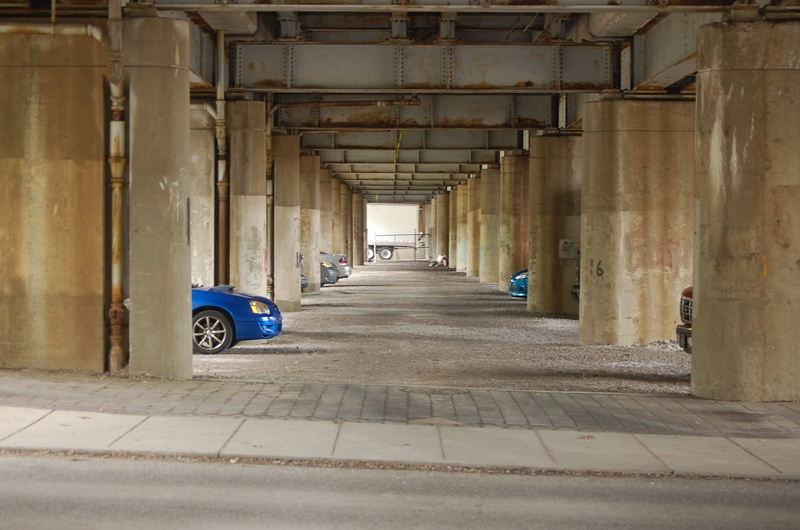 People who work downtown park their cars here. I also understand it is a place for the homeless to stay. 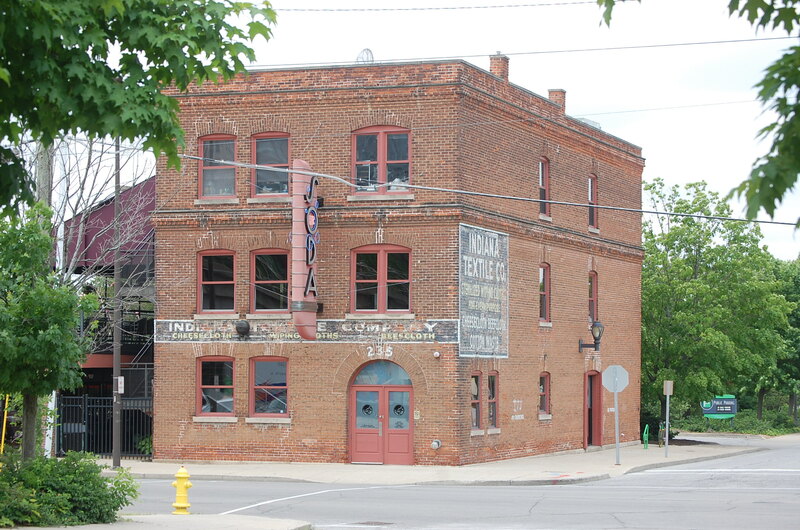 A complete picture of the Club Soda building. On the left they have added a terrace and outdoor seating. Our next stop was Henry’s. That’s all you have to say, it’s been in Fort Wayne for as long as I can remember. I ate there in April. 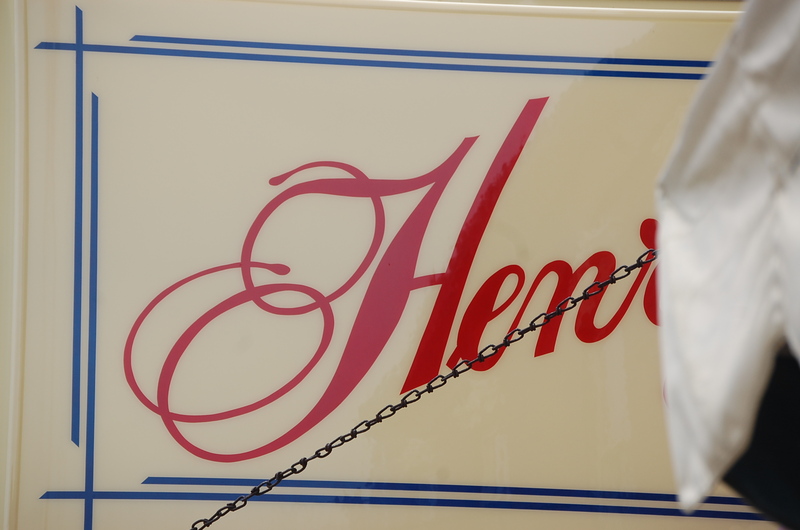 Wendy needed the”H” in Henry’s. 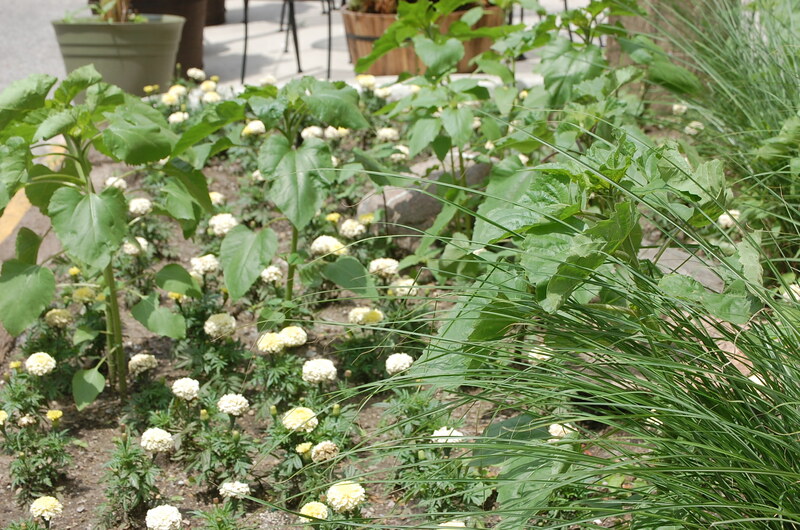 They had set up some outdoor seating and planted this little garden beside it with marigolds, sunflowers and perennial grass. 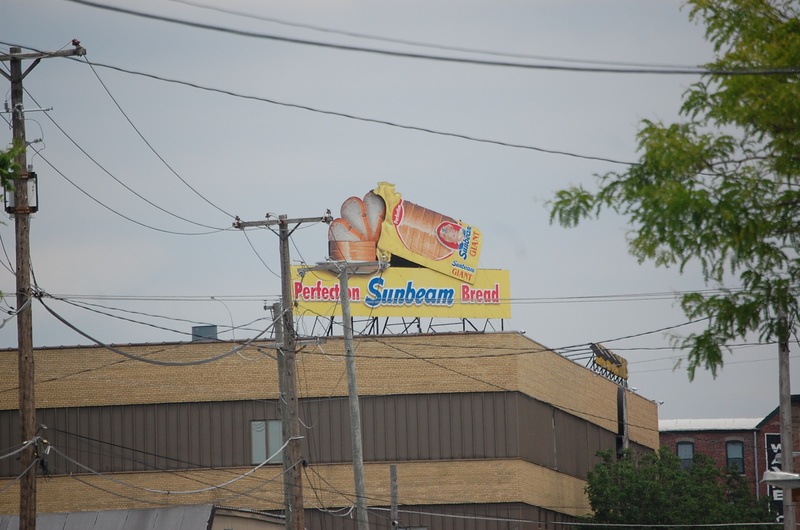 The Sunbeam Bread Company is just down the street from Henry’s. 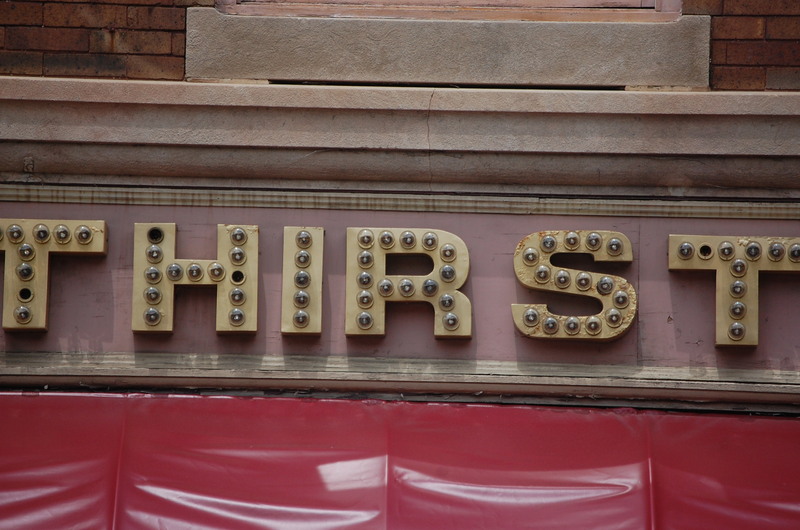 This sign is a Fort Wayne Icon. You drive past the building on Main Street and the bread slices move and the most wonderful smell comes out of the building when they are baking the bread. It is owned by Aunt Millies now. 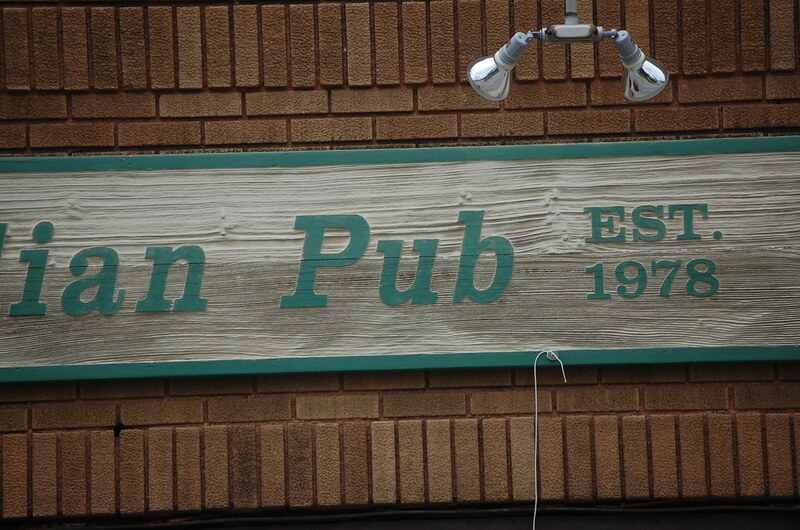 O’Sullivans Pub was next on the agenda. This has also been around for as long as I can remember. 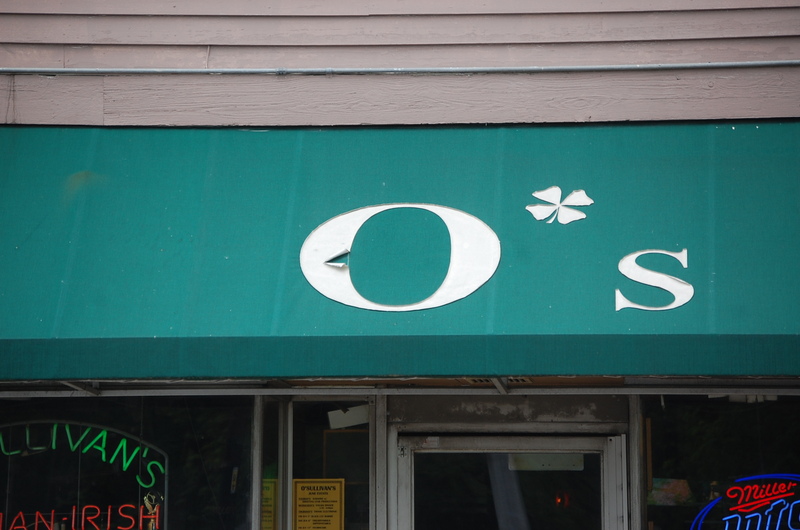 She needed the “O” and the “u” from the sign. This place is huge during St. Patricks day as you can imagine. The reviews on any site I looked at were not good. If you drink enough alcohol it kills the germs I suppose. 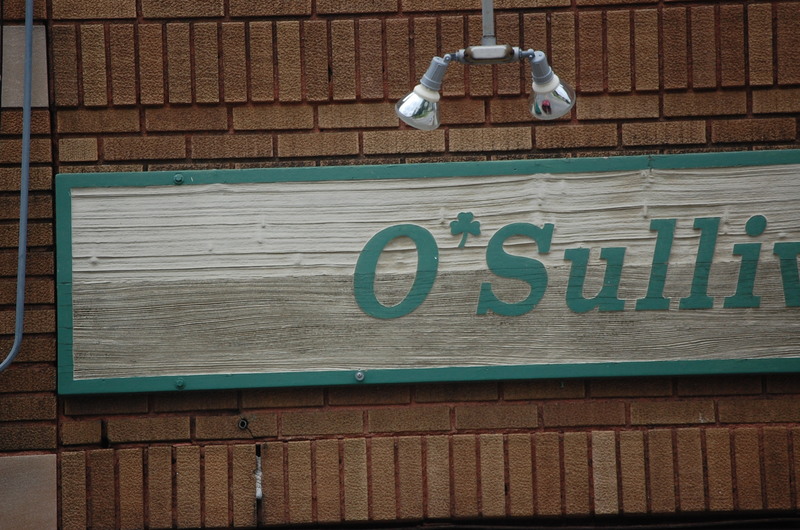 I think this building has been a bar for a long time and I see O’Sullivans was established in 1978, the year I graduated from high school. 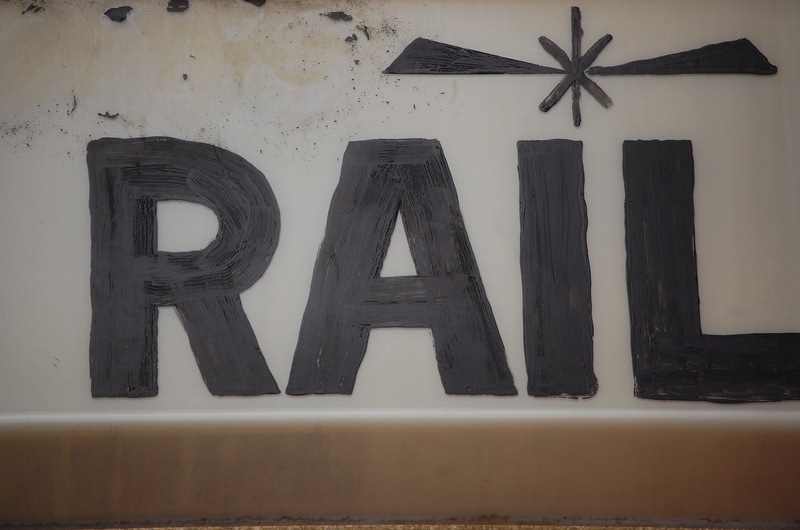 I also snapped the O on the overhang. Thought is had character with the rip in it. Our last stop was the Brass Rail on Broadway. I am not a bar person so I had not heard of this place before now. 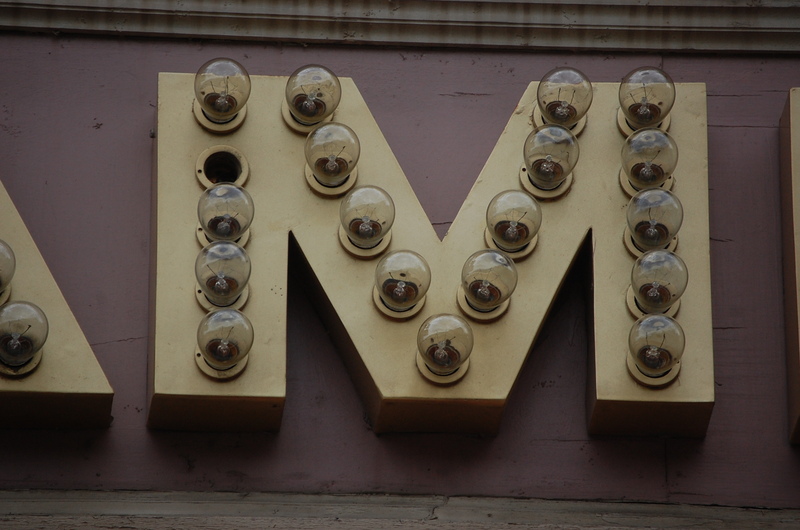 It has an interesting web site, apparently it has lots of live acts. 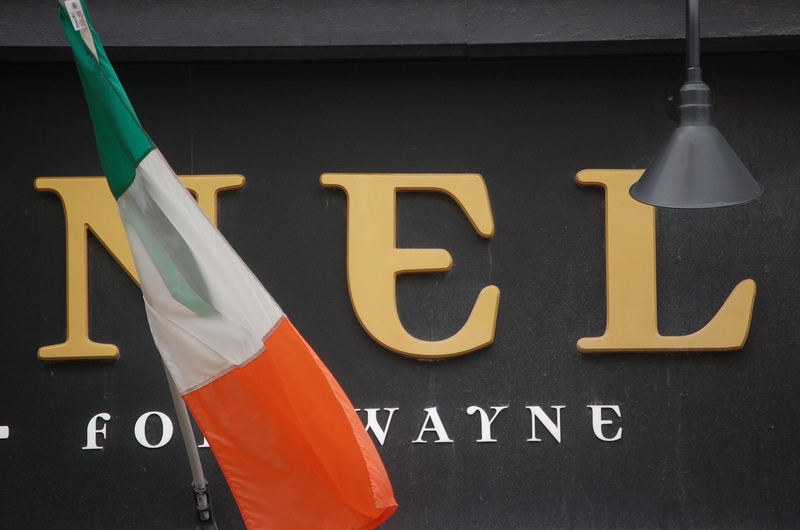 It is in a little more blighted area of Fort Wayne but is right next to an antique mall. Across the street is a Jazz Club and it looked like people were redoing their houses so it was all interesting and an education for me. 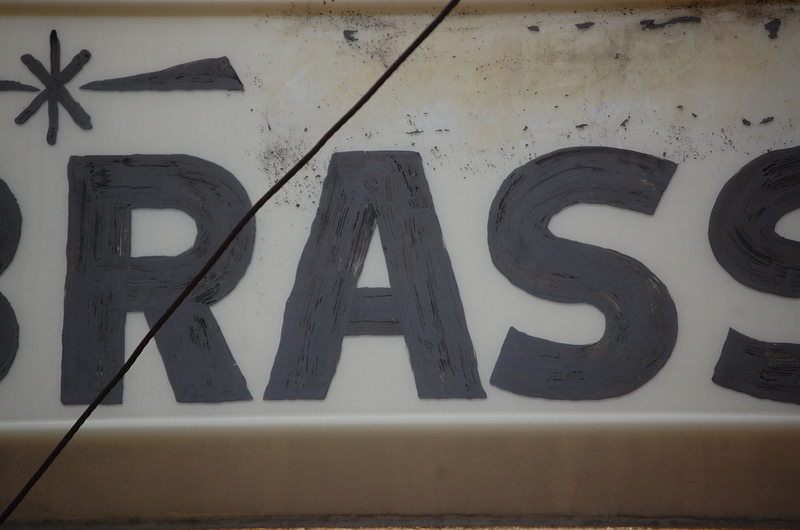 The “A” in the sign is what we were after. 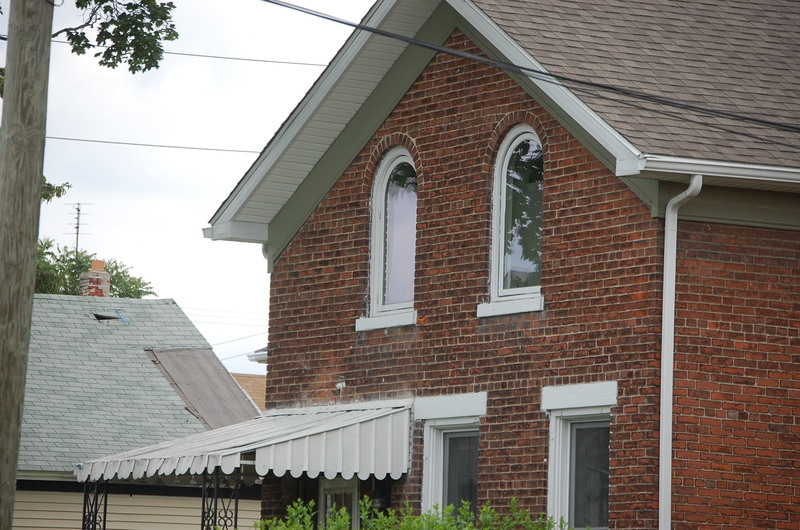 This house was on a sidestreet and I thought the upper floor windows were very neat. 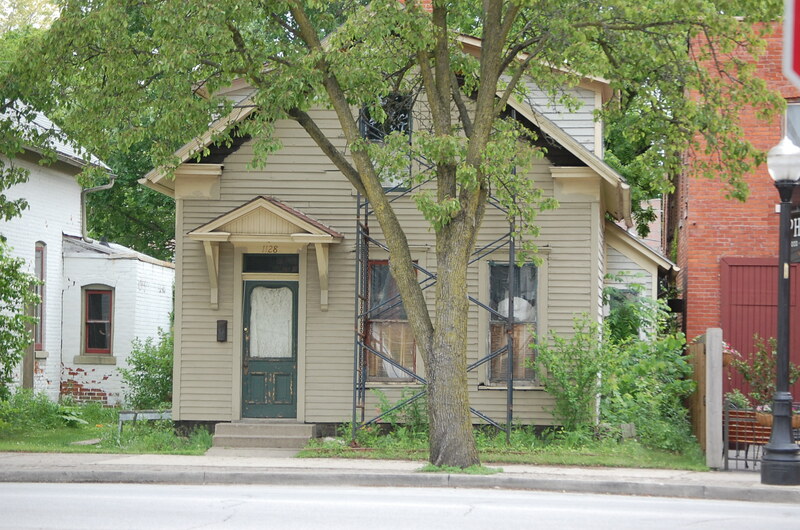 This house was across the street next to the Jazz Club. It looked old and with the scaffolding up they were remodeling it I am sure. 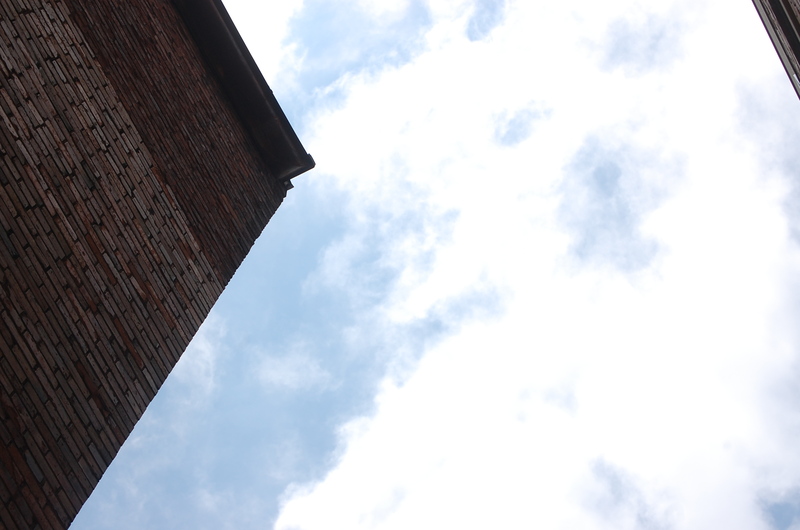 Thats all I have today, hope you enjoyed exploring Fort Wayne with us. Thanks for stopping!